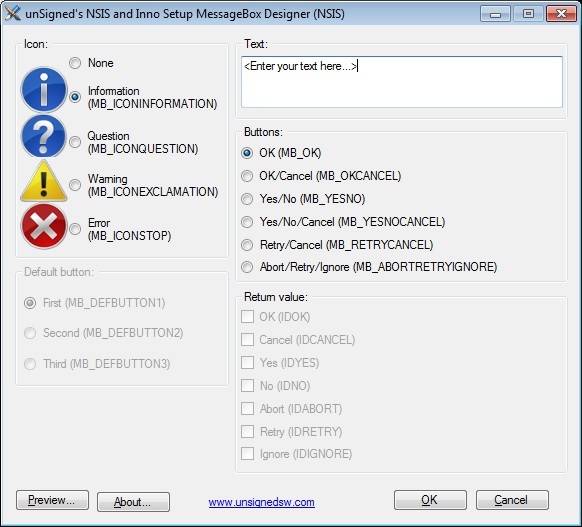 Windows application with user friendly GUI (Graphical User Interface) for fast and easy creating of MessageBox instructions (script generator). Application is present in newer packages of Graphical Installer (the same version): Graphical Installer for NSIS and Graphical Installer for Inno Setup. Tip: Work with this application is very simple and we recommend you to use it to save a lot of time during writing installation scripts. Step #1: Select icon of your desired MessageBox dialog on the left. You may choose 'None' for no icon (all icons are standard Windows icons). 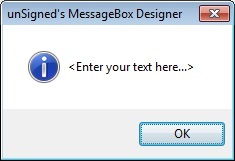 Step #2: Enter text which should be displayed in your desired MessageBox dialog. Step #3: Select buttons which your desired MessageBox dialog should contain. You can click the Preview button to show preview of your desired MessageBox dialog. Preview is based on values you chose. MessageBox dialog is shown - you can close it with the ESC key. Step #4: Generate resulting script by clicking the OK button. The resulting code is shown in new window. Resulting code is copied to clipboard and you can paste it into your editor. 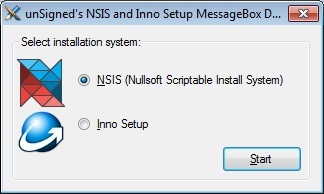 Tip: If you are running application directly (double-clicking the .exe file in installation folder) you may see the NSIS or Inno Setup selection dialog. To skip this dialog launch the application with /NSIS or /INNO (/INNOSETUP) parameter.